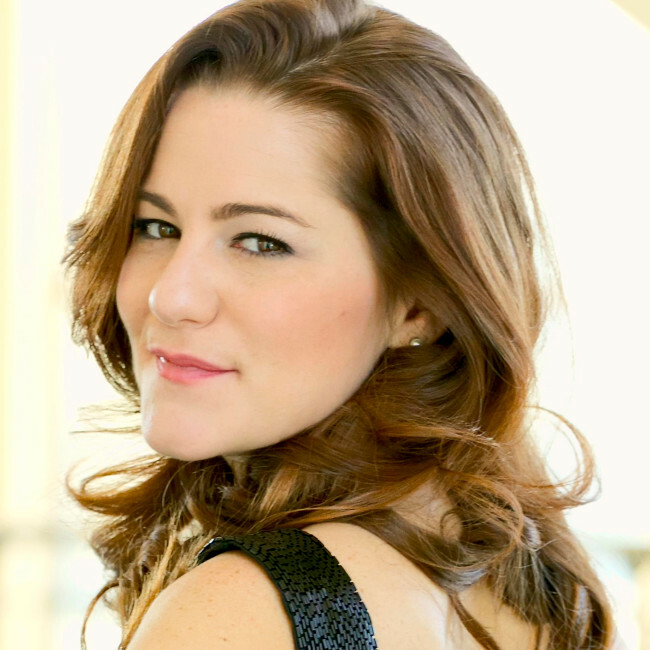 Join us February 12th for one of OperaDelaware's favorite singers, mezzo-soprano Megan Marino (Angelina in this season's Cinderella), in a Sunday afternoon recital featuring many of her personal favorites. Join us February 12th for one of OperaDelaware's favorite singers, mezzo-soprano Megan Marino (Angelina in this season's Cinderella), in a Sunday afternoon recital featuring many of her personal favorites. This is a wonderful opportunity to get to know one of today's most exciting operatic artists—up close and personal! Marino will be accompanied by pianist John Arida. The program will be followed by a "talk-back" session moderated by OperaDelaware's General Director Brendan Cooke. Ms. Marino appears courtesy of The Metropolitan Opera. Hailed by the Washington Times for her “considerable range and confidence, navigating lower notes with impressive clarity yet also managing considerable leaps into the higher range as well, exhibiting a warm, plummy tone throughout,” Megan Marino makes her OperaDelaware debut this season. In addition to her engagements with OperaDelaware, Ms. Marino makes her debuts with the Lyric Opera of Kansas City as Hänsel in Hänsel und Gretel and Virginia Opera as Rosina in Il barbiere di Siviglia in the 2016-17 season. She also returns to the Metropolitan Opera as Second Wood Nymph in the company’s new production of Rusalka as well as for Roméo et Juliette and Central City Opera for Despina in Così fan tutte. Last season she made her debut with the Lyric Opera of Chicago as Annina in Der Rosenkavalier and sang Rosina in Il barbiere di Siviglia with both Fort Worth Opera and Florida Grand Opera. She also returned to Des Moines Metro Opera for her first performances of Meg Page in Falstaff, Opera Fort Collins for Angelina in La cenerentola, and the Metropolitan Opera roster for Rigoletto. She made her Metropolitan Opera debut as a Voice of an Unborn Child in Die Frau ohne Schatten and has also joined the company for its productions of Rusalka, Don Carlo, and Werther. She joined the Spoleto Festival U.S.A. for Varvara in Káťa Kabanová, Green Mountain Opera and Baltimore Concert Opera for Angelina in La cenerentola, Opera Iowa for Hänsel in Hänsel und Gretel, Opera Fort Collins and Saint Petersburgh Opera for Rosina in Il barbiere di Siviglia, and the Fire Island Opera Festival for the Third Schauspieler in Weill’s Der Protagonist. She sang Miriam and Ruth in the American premiere of Weill’s The Road of Promise with the Collegiate Chorale at Carnegie Hall, which will later be released as a commercial recording, and joined the rosters of the Lyric Opera of Chicago for Anna Bolena and San Francisco Opera for Partenope. Ms. Marino is a winner of The William Matheus Sullivan Musical Foundation Award as well as the Shaulis/Gasperec Emerging Singers Grant from Opera Index. She is also a 2015 second prize winner in both the Gerda Lissner International Vocal Competition and the Opera Birmingham Vocal Competition, at which she also won the audience favorite award, as well as an encouragement award recipient from the George London Foundation competition. In 2014, she won first place winner of both the Marcello Giordani Foundation International Vocal Competition and Oratorio Society of New York’s Lyndon Woodside Oratorio Solo Competition. Following the summer of 2013 spent at Santa Fe Opera, Ms. Marino received The Katharine M. Mayer Award from the company. She is a previous second place winner of the Forth Worth Opera McCammon Competition and third place winner of the Lotte Lenya Competition and the Shreveport Opera Singer of the Year Competition. She has previously been a regional finalist of the Metropolitan Opera National Council Auditions and has placed multiple times at the Denver Lyric Opera Guild Competition. She is also the recipient of a career grant from Allied Arts. She holds a Bachelor of Music degree from the University of Southern Maine.